Someone recently asked me how many recipes I have, and I truly had no idea. My blog stats revealed 877 published recipes and well over 1,000 when counting drafts of in-the-works recipes. Of course, that doesn’t include the countless Word docs on which I type recipes that have received my official stamp of approval. Then if I tweak the recipe, I have one master copy that’s legible. I used to take notes as I worked on my recipes and then type them when ready to share on my blog. After too many episodes of not being able to read my own writing or, worse yet, being unable to locate the scrap paper on which I inevitably scribbled, I knew there had to be a better way! The Word document ensures accuracy, which I’ve always felt is of utmost importance. If readers spend the time and money on a recipe, I want them to have a good outcome. With the high number of recipes already on the blog, it’s easy to forget about some of the early favorites that have become buried in the archives. A quick look at the early (read: bad) photos may also be reason to keep on scrolling! 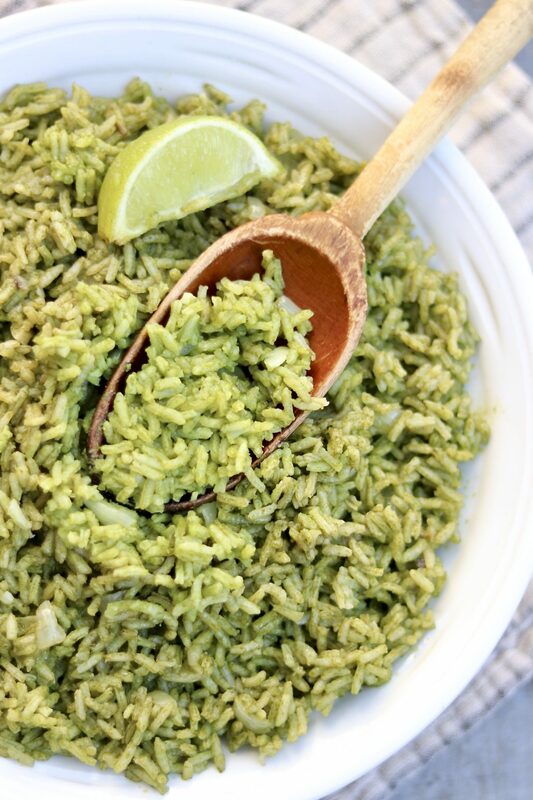 Such is the case with the following gem, which was initially inspired by the flavorful cilantro lime rice dishes that so many of us enjoy. The recipe relies on a mix of broth and coconut milk to add savory and aromatic notes. 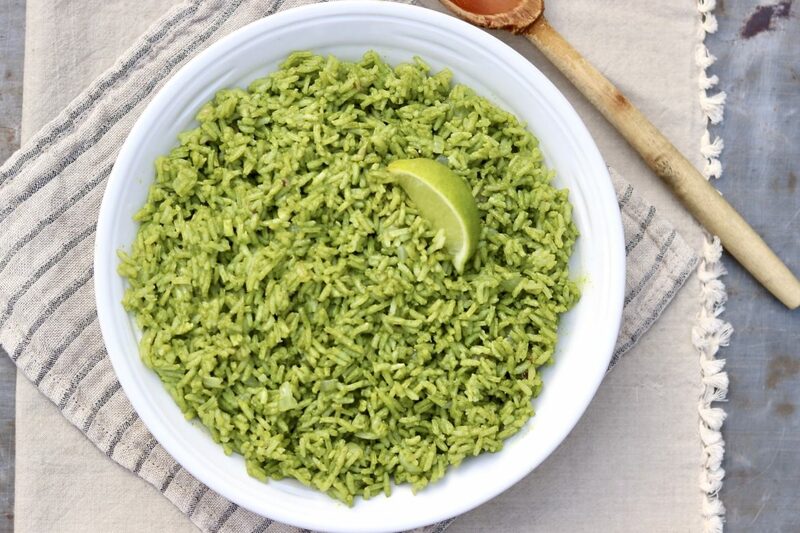 Dark leafy green and herbs ramp up the nutritional profile and flavor and paint the rice a vibrant shade of green. I distinctly remember the first time I prepared this rice. My boys were quite young and I had my doubts as to whether they’d take a single bite. At the time, they weren’t especially keen on cilantro and my younger son was at his height of pickiness. As I blended the greens into the chicken stock and coconut milk－both of which are fabulous for cooking rice (vegetable broth may be used for a vegan meal)－my kids, who were sitting at the nearby kitchen island, looked at me with a rather puzzled look. I mean really Mom, green rice? As we ate dinner that evening, they confessed they were a bit scared about the recipe but truly sang its praises. 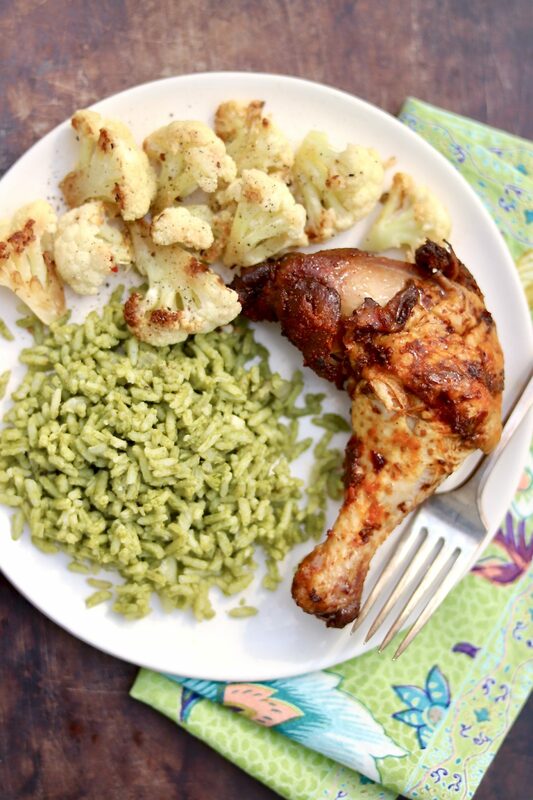 The recipe makes a generous amount, and happily, leftovers are equally delicious. Those who are squarely rooted in camp cilantro could add a little extra on top. In terms of other alterations, spinach would be a good alternative to the kale and two scallions could stand in for the chives (that latter of which I’ve omitted altogether when I didn’t have fresh on hand). Everything on the above-pictured plate is leftover (and it still looks pretty good, huh?). I’m a firm believer in making more than we need on any given night, as it always comes in handy for quick meals in the following days. 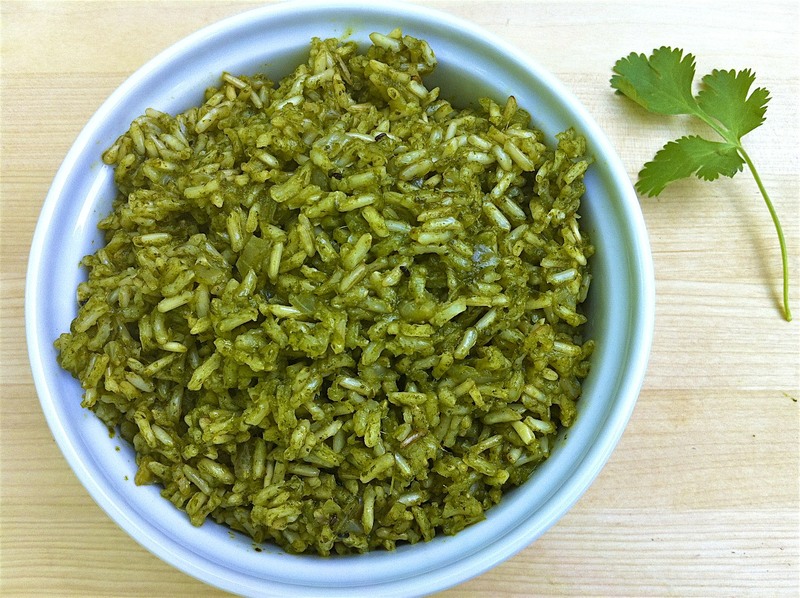 The photo below is green rice from my original 2012 recipe post. Life gets busy and so many people report struggling with quick healthy meal ideas. For me, creative use of leftovers is often the answer. 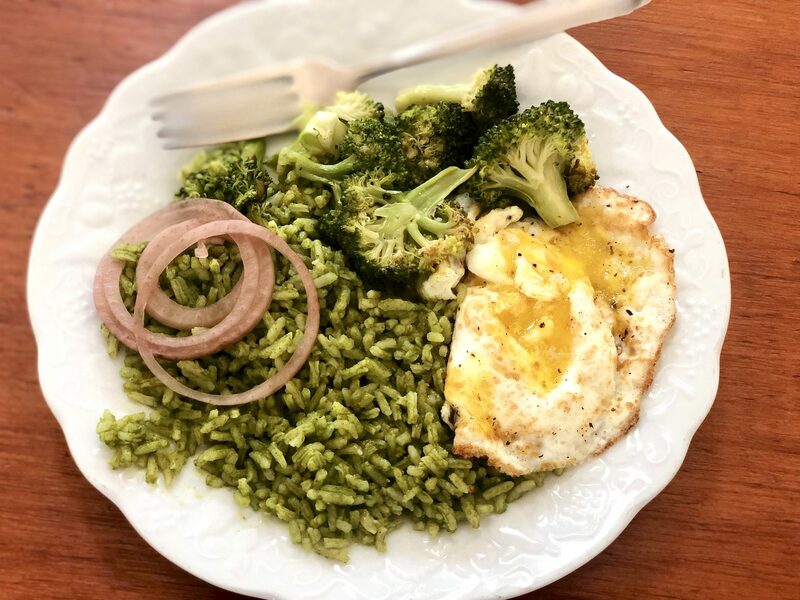 For this simple but utterly satisfying lunch, I heated leftover green rice and roasted broccoli and rounded it out with a fried egg and a few pickled red onions. It covered all the bases－filling protein, nutrient-rich carbs and healthy veggies－and took mere minutes to prepare. 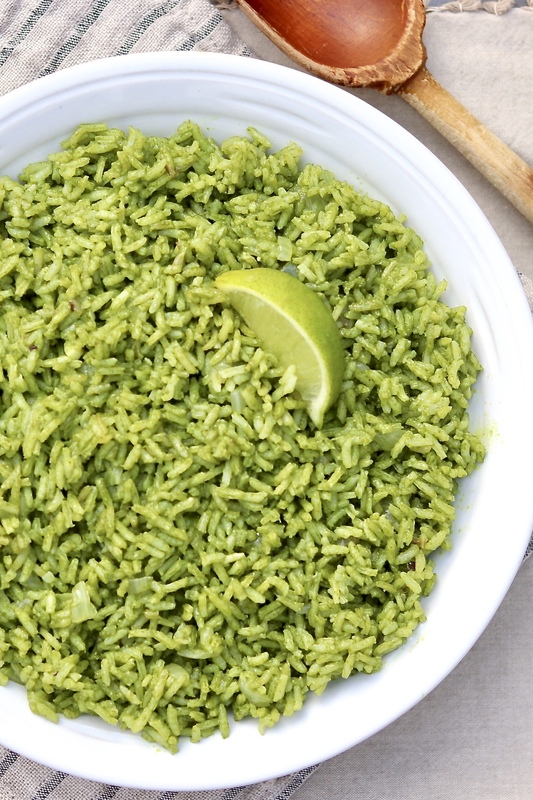 This colorful rice is bursting with flavor and good-for-you ingredients. Leftovers are always welcome, as the flavor improves over time. You may also prepare the rice 2-3 hours in advance, allow it to sit at room temperature, and gently reheat when ready to eat. Put the cilantro, kale, chives and broth in a blender and blend until the vegetables are puréed. Add the coconut milk and salt, and blend until the mixture is smooth. In a medium saucepan with a tight-fitting lid, heat the olive oil over medium heat and saute the onion until it softens, 2-3 minutes. Add the rice and garlic and saute, stirring occasionally, until the rice begins to lightly toast, 3 to 4 minutes. Add the contents of the blender, stir well, turn the heat to high, and bring to a boil. Cover the pan, turn the heat to low, and cook for approximately 15 minutes or until the liquid is absorbed and the rice is tender. Tip: Remove the lid and check the rice 3-5 minutes early. Give the mixture a good stir. If the liquid is mostly absorbed but the grains are still not done, add a little extra water or broth－start with ¼ cup or so－and continue to cook until the rice is tender. When the rice is cooked to your liking, remove the pot from the heat and let the rice steam in the covered pot for 5 minutes. After 5 minutes, stir in the lime juice to taste, fluffing with a fork, and serve. •You may use brown rice, if preferred. Start checking for doneness after 25-30 minutes and add more broth or water as needed. Ooh, I have to try this. It sounds so good, and an easy way to get my little guy to eat some more greens. Brianne, the first time I made this, I was shocked by how much my kids loved it. It seemed a little risky: ) Hope your little guy likes it as much! Ann, this is beautiful, and a great way to sneak a few extra veggies in, I can’t wait to try this. The ultimate challenge, my rice loving, non veggie eating middle child,. I’ll let you know how it goes! Pinned, thanks for sharing! I love a good challenge and I can’t wait to hear how this goes on your end. My kids were looking at me like I was crazy when they first saw the green liquid. I was prepared for failure and was pleasantly surprised. Wishing you the same outcome! Pingback: The Fountain Avenue Kitchen – Throw Back Thursday — Green (Brown) Rice…the flavor is amazing and it’s so healthy, too! I don’t have the cilantro-loving gene, so what can I substitute for cilantro? Hi Miriam, I might try a combination of fresh basil and curly parsley. (Curly parsley tends to be milder than flat leaf.) You could even try using spinach which would be milder yet. LOVE this recipe! It would be so good with grilled chicken or fish… Can’t wait to try it! It would be, Michele. If you try, I hope you like it as much as we do! this looks yummy but I know I will not be making it for my clan! I “ruined ” them for green stuff when I sent them to school with green milk and green pears( canned pears with green food coloring) . You should have heard that out-cry!